This one sat on my Kindle far too long before I finally read it. 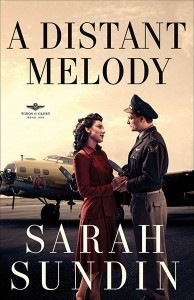 A Distant Melody by Sarah Sundin is delightful. World War II pilot Walter Novack is home on leave for his buddy’s wedding. He’s often tongue-tied around unattached women. The only exception seems to be the bride’s friend, Allie. Except Allie is spoken for. She’s expected to marry her father’s top executive and keep the business in the family. Allie has always gone along with her parents’ wishes. Until she meets Walt and he awakens something in her. Not rebellion, exactly, but more like the desire to do what God asks of her. When Walt learns Allie has a boyfriend, he retreats but his affection is too strong. He would rather be her friend, then not to talk to her at all. Walt and Allie trade letters for months, while Allie learns more about God and what it means to be an obedient Christian. Sarah Sundin’s research and familiarity with World War II is impeccable. The characters are real and full. I highly recommend A Distant Melody.